Calories in Food – How to Calculate and Why? This is not a trick question ... but for something that most of us talk about (or think about) all time, very few can explain exactly what calories are without pausing. Calories in food are a measurement of energy. They represent the energy released when that food is eaten. Why the confusion about calories? There is confusion around the use of the term calorie. The meaning is different, depending if you are a chemist or a member of the public reading a food label. Scientists use the term calorie to mean the energy required to raise the temperature of 1 gram of water by 1 degree Celsius. A Calorie, as the term is generally used in North America by nutritionists and the public, is what a chemist would call a kilocalorie (1 kcal); it's a 1,000 times bigger than a scientist's calorie. When we use the term calorie here, we'll refer generally to the commonly used definition of Calorie and skip the reference to kilocalories, even though it is scientifically accurate. For an amusing discussion on the multiple definitions of calories and the confusion they have caused, read Marion Nestle's recent book Why Calories Count. How are calories in food calculated in other regions? As mentioned, in North America, we generally use the term Calorie (the equivalent of a kilocalorie or a 1000 calories, if you're a scientist), especially on food packaging. In Europe and elsewhere, the term kilojoule is common. Now enough about semantics - time for some meat! Of course, we'll make it lean. Why knowing the Calories in food is important, especially when trying to lose, gain or maintain weight. To maintain the same weight, the amount of Calories eaten, should equal the number used. increase the amount of energy expended. The golden rule for losing weight is that energy intake should be less than energy output. It is why so many people find counting calories in food or, at a minimum being aware of calories consumed, is an effective weight loss strategy. In fact, calorie counting for decades was the orthodoxy in weight loss circles. While we have learned there are other factors that affect success in weight loss including appetite and blood sugar control, feelings of satiety, along with the nutritional value of foods that can assist with weight management, there is something you can’t escape…. … calories are still king. How much energy you consume and balancing with how much energy you burn is key to weight control. The First Part of the Weight Loss Equation - How to determine the amount of calories in food? There are several ways to count calories in food. One is by reading food labels. Calorie counting by way of food labels is based on serving size, so it is important to know what the label considers a serving size. Is a serving 1 slice or 2? Is it ½ cup or 2 cups? The answer can make or break your calculation …. so pay attention. Another way to count calories in food is to refer to a calorie counter or food calories list. There are many pocket food calories list books convenient for restaurants, as well as on line resources. Again, pay attention to serving size. One free on line calculator list of calories in food is Supertracker, the Calorie and Nutrition Counter from the USDA. It provides a convenient food calories list. Some jurisdictions mandate chain restaurants to list the calories in food on menus. Research indicates that this has a small, if significant, effect on patrons' eating behavior including reducing the number of calories they consume. Press here to read more about research about the effect of restaurant menus listing calories in food. There are also free calorie counter apps that ensure the number of calories in food is at your fingertips when and as needed. Check out this free calculator called My Diet Diary by MedHelp. Calories don’t say anything about a food’s quality. Today, most healthy and long term weight loss or weight maintenance strategies consider both the quantity of food through calories and the quality of food through nutritional composition. 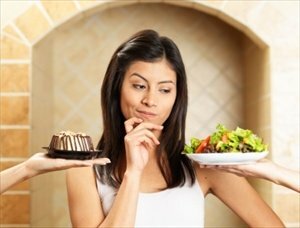 A healthy balanced diet that sustains blood sugar levels between meals, lessens cravings, and provides nutrients the body needs is a superior weight loss diet plan than one that ignores these factors and only looks at food calories – failing to distinguish between healthy calories and empty calories in food. A serving of sardines (1 can of 92 grams) is 140 calories; a serving of Coke Classic (12 fluid oz. /355 ml)) is 140 calories. You don’t need to be a dietician to know which is the more nutritious food – sardines or Coke? Weight Loss Info - How many calories in a pound of fat? There are 3,500 calories (35 kilocalories) in a pound of fat. Through reducing calories alone, you could lose a pound a week by eating 500 fewer calories per day from your current intake. This assumes that you currently are maintaining and not gaining weight. Naturally, if you increase the amount of energy burned, you could lose a pound per week with a smaller decrease in calories eaten. How Are Calories in Food Used? The average person uses about 60% of calories just to stay alive including sleeping and lying down. The rate at which you burn calories for this purpose is called basal metabolic rate (BMR). Whether it’s running to the car, around the block or sweeping the floor, the average person expends around 30% of their calories doing physical activity. This is a person’s active metabolic rate (AMR). Obviously, physically active individuals will have a higher AMR than those more sedentary. Thermogenesis means heat creating, which links with the whole concept of calories – recall a calorie is the measure of heating 1 kg of water 1 degree Celsius. It follows that dietary thermogenesis is the calories burned eating, digesting and absorbing food. The following are several ways to burn additional calories in food. Standing still while increasing your basal metabolic rate. Increase your muscle mass by working out regularly. Muscles take more energy to maintain than fat, so increasing your proportion of muscle mass to fat can increase your metabolic rate and the amount of calories you burn. Exercise. Studies show that intense aerobic activity will boost your resting metabolic rate for several hours after you’ve stopped exercising. Twenty minutes of intense exercise will have several hours benefit with respect to increasing you BMR and calories consumed. Lower the thermostat - A cold shower can increase your resting metabolic rate along with keeping lower house temperatures generally. A cool atmosphere forces you to burn more energy to maintain body temperature – 98.6 degrees Farenheit/37 degrees Celsius – a figure considerably warmer than the average house temperature. Note that our skinnier forbearers lived without central heating. If you consume 140 extra calories per day [remember that’s the calories found in one 12 fluid oz (355 ml) of Coke Classic] over what you need, you will have gained 14.6 additional pounds by the end of the year. Ensure your thyroid gland is functioning normally including producing or utilizing sufficient thyroid hormone. Thyroid hormone affects your BMR. While you neither want to much or too little thyroid hormone, if you don’t have enough, you may become hypothyroid, a state in which your metabolism can slow, if untreated. Several medical conditions can provoke hypothyroidism. Middle age and being female are risk factors for some thyroid conditions. Get moving to increase your active metabolic rate. Walk or bike instead of drive.Take the stairs instead of the elevator.Park a distance from your destination and walk the remainder.Pick up the pace when walking; better yet, run or jog.Aim for a minimum of 3 workouts per week in which the heart rate is raised for a minimum of twenty minutes. But any exercise is better than none. Check with your health practitioner, before starting an exercise program. Eat Right and increase dietary thermogenesis. While all food is thermogenic – energy is required to digest it - studies show that eating protein, as opposed to fat, leads to greater metabolic output. Digesting carbohydrates expends energy somewhere in between proteins and fats. It follows that eating lean protein foods would have the most benefit from a metabolic perspective.Eat spice - Studies indicate that the capsaicin in hot pepper can increase your rate of metabolism for several hours after eating.Aim to eat several small meals throughout the day. Experts suggest that you burn more calories by eating several small meals rather than two or three large meals during the day. Extending the digestion process over time by frequent eating can increase metabolism. Beware, however, that you don’t increase your calorie intake inadvertently by eating more often. Our metabolic rate and, therefore our use of calories at rest, is not always under our control and an increased rate is not necessarily a good thing. State of Health/existence of disease – some cancers like leukemia and tumor forming malignancies require extensive energy for tumor or cell growth. Age - children have a relatively high metabolic rate because they and their organ systems are growing. Stress or adrenal problems can promote the release of stress hormones that can increase one’s rate of metabolism. How many calories do we need to survive? It varies based on age, weight, gender, activity level, health status, as well as individual metabolism. The USDA and Department of Health and Human Services in their 2010 document Dietary Guidelines for Americans provides a table outlining the "Estimated Calorie Needs per day by age, gender, and physical activity". You can download the full dietary guidelines as follows. While the amount of calories varies for women and men according to the USDA statistics, a 31 to 50 year old average (5'4" and 126 lbs) healthy American female would require between 1,800 and 2,200 calories, depending on her activity level. In contrast, the average healthy American man (5'10" and 154 lbs) in that age range would require between 2,200 and 3,000 calories to maintain body weight. Note that the above stats are American averages. The nutrition researcher Dr. T. Colin Campbell in his book The China Study: The Most Comprehensive Study of Nutrition Ever Conducted And the Startling Implications for Diet, Weight Loss, And Long-term Health notes that the average rural Chinese, who consumes primarily plant proteins and less fat than the typical American who eats more animal proteins and more fat, consumes more calories than their American counterpart. An American male of 77 kg (169.5lbs) will consume on average 2,400 calories per day; a rural Chinese of the same weight, 3,000 calories. This figure allegedly takes into account differences in physical activity. The problem with standardized food calorie charts, like the one above, is that they are standard and we are not. We come in all shapes and sizes. An alternative to standardized charts is a formula that considers the many factors a standard food calorie chart cannot. Such factors include age, weight, height and health status. The Harris-Benedict formula was published in 1919 by two researchers examining basal metabolic rates in humans. The formula takes into account the above factors in determining how many calories in food a person needs to survive. Harris Benedict Calculator found at The Nutrition and Food Web Archive The advantage of this calculator is it considers health status as a factor that will affect your caloric needs. I mention below another calculator if your goal is to lose weight. Interested in Learning More about Calories in Food? For a crackerjack book about the science and politics of calories and weight loss check out the new book by Marion Nestle and Malden Nesheim, Calories in Food. From where should you get your Calories in Food? Children, especially younger children whose brains are still developing, require a higher proportion of fat and less protein than adults. Calories in Food – Which Macronutrients Have the Most Calories? While not a macronutrient (except for some people) alcohol contains 7 calories per gram, although individual drinks will vary depending on added ingredients. 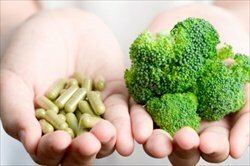 It is important to understand that the above information is limited in its usefulness, because foods are almost always comprised of a combination of nutrients in varying proportions. The main exceptions to this are butter (100% fat) and sugar (100% carbohydrate), which people often eat pure. The mixed nature of most food is why knowing its calories is important for accurate calorie counting. Eat smaller portions at meals and don’t have seconds. Eat slowly and chew well so that you give your body and brain time to receive satiety signals. If full, don’t finish everything on your plate. Snack on low cal high fiber fruits, vegetables and whole grains that leave a sense of fullness but are low in calories and high in fiber. For meals focus on low glycemic foods and combine carbohydrate with some lean protein or good quality fat to sustain even blood sugar levels between meals. Carry a list when you grocery shop and don’t shop when hungry so as to reduce impulse purchases of high calorie items. Watch calories in what you drink. Juices (even 100% fruit juice), alcohol, dairy beverages, soda and other sugary drinks including teas and coffees with added milk and sugar can be high in calories. Because of the ease with which something can be drunk, as opposed to eaten, beverages are a prime way of ingesting too many calories. Water is calorie free! Skip calorie rich high sugar and high fat processed foods. Eat instead whole foods including complex carbohydrates. These are generally lower in calories relative to the beneficial nutrients they provide. Don’t be fooled by the weight loss hype and overindulge in high calorie but empty calorie foods unknowingly. Foods touted as “low fat” can be “high in sugar” and, therefore, high in empty calories. How to figure out how many calories in food you need to maintain, gain or lose weight? calorie calculator based on the Harris-Benedict equation. While this calorie calculator doesn’t consider your health status, it gives a heads up on how many calories you’ll need, if physically active to varying degrees; as well as how many calories you’ll need to cut on a per day basis to achieve your goal weight. This calorie calculator is ideal for those interested specifically in weight loss. So good luck with your calorie counting and remember the most important part of all.... enjoy your food. Click here to learn more about Healthy Balanced Diets. Click for more Healthy Diet Tips. Click to read about Unhealthy Foods to avoid. Following Low Glycemic Diets can prevent cravings between meals and, therefore, help you maintain a moderate calorie intake. The important fact to remember is that while monitoring you calorie intake is important, following a nutritious and healthy diet is key to any long term successful weight loss program. Click here to read more about the research surrounding menus listing calories in chain restaurants. For timely news and commentary on diet and food, click Healthy Diet News Blog.